Disney and 21st Century Fox are closing in on a deal that could come as soon as next week, CNBC reported on Tuesday. It’s the latest development in a bidding war for Fox that also involves Comcast and Verizon, which have also reportedly made offers for parts of the business. Disney and 21st Century Fox are closing in on a deal that could come as quickly as next week, according to a CNBC report citing sources familiar with the matter. The transaction would involve Disney acquiring Fox’s studio and television production assets – a portion of the business that has an enterprise value of more than $US60 billion, CNBC’s sources say. The package sought by Disney reportedly includes Fox’s A&E and Star TV networks, as well as its regional sports operation, movie studios, and stakes in Sky and Hulu, among other assets, according to the CNBC report. As proposed, the deal would leave Fox with its news and sports assets. This latest development comes amid considerable interest for Fox from the likes of Comcast and Verizon. 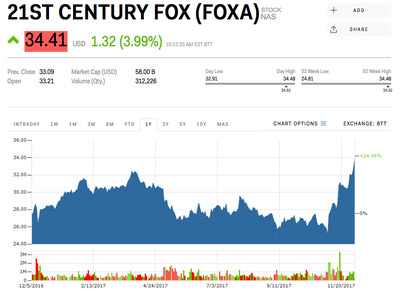 The Wall Street Journal and CNBC reported in November that both had approached Fox about buying at least part of the company – which, combined with Disney’s interest, was expected to spur a bidding war. Should Disney prevail, it will have to contend with rating declines across many large cable networks as more consumer opt for cheaper and more customisable web-based services. Fox’s stock climbed 3.9% on the report, while Disney shares dropped 1.4%.